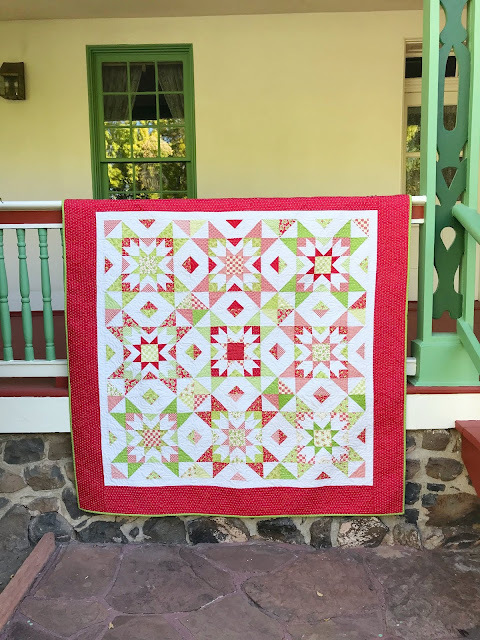 Primrose Cottage: Nesting Stars Final Reveal! Hey everyone! We made it to the end! wahoo!! I had soo much fun doing this sew along! I have really enjoyed seeing everyone make their blocks and how different each quilt has turned out! I am so grateful for everyone that sewed along with me. Here is my quilt! I love how it turned out! It is so festive for the holidays, and I just love how scrappy it is! To qualify for the prize, you have to have your quilt top completed by November 8, 2018. I will draw the winner for both prizes on November 9th! 1.You get your quilt quilted by me! 2. Prize pack of 4 of my patterns! 3. Scrap pack of Gretel Fabric by Diary of a Quilter! Please email me pics (primrosecottagequilts@gmail.com) or use the #nestingstarssewalong so I can see your blocks! The winner of the charm pack for week 9 is Gayle M.
That is a beautiful quilt. I've been following along on the QAL. I can hardly wait to see all the quilts.